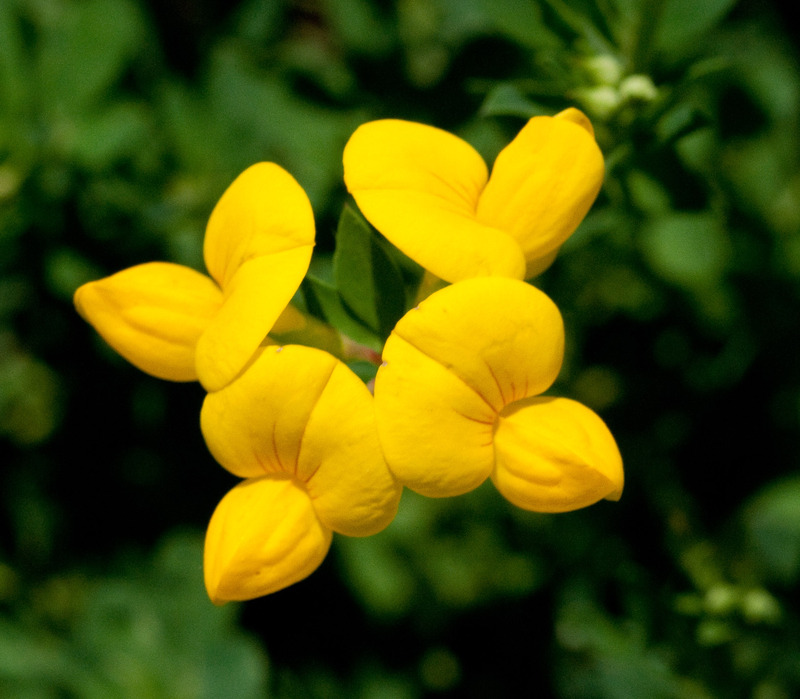 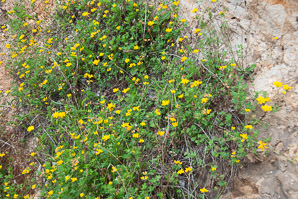 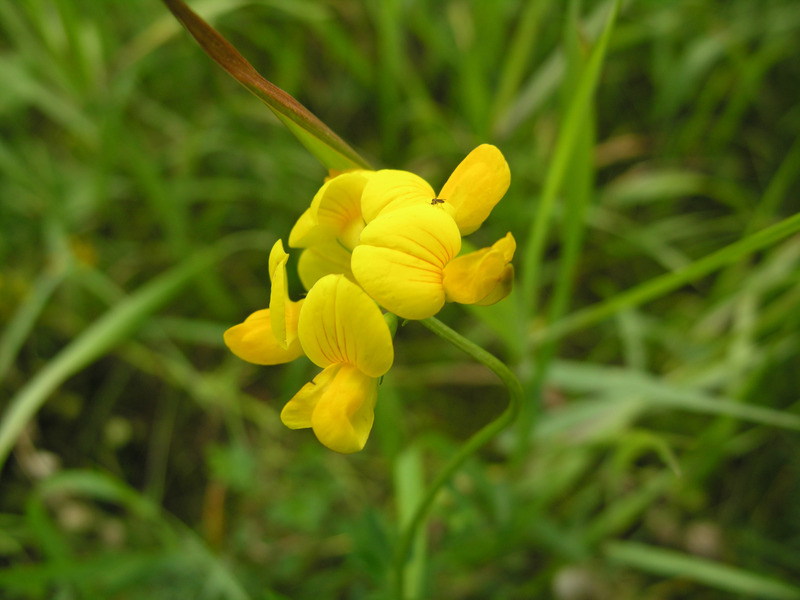 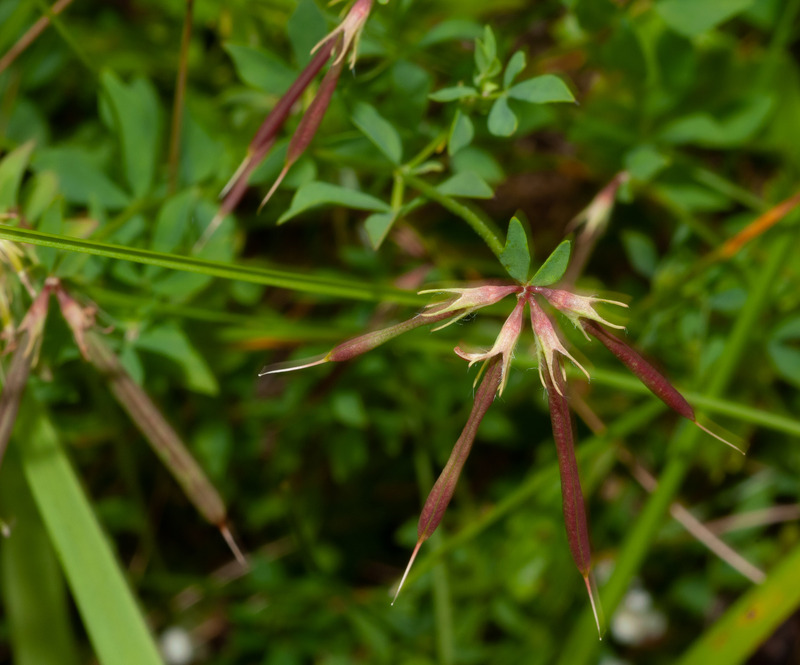 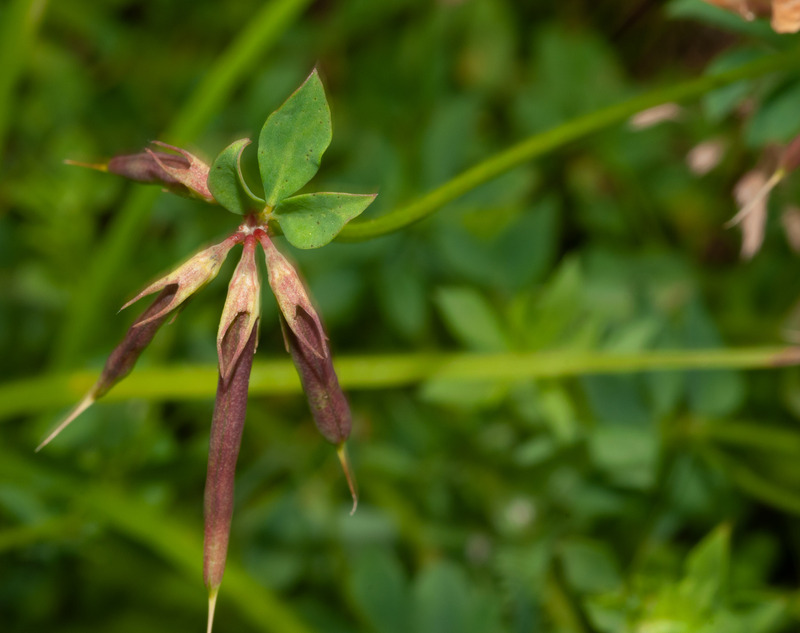 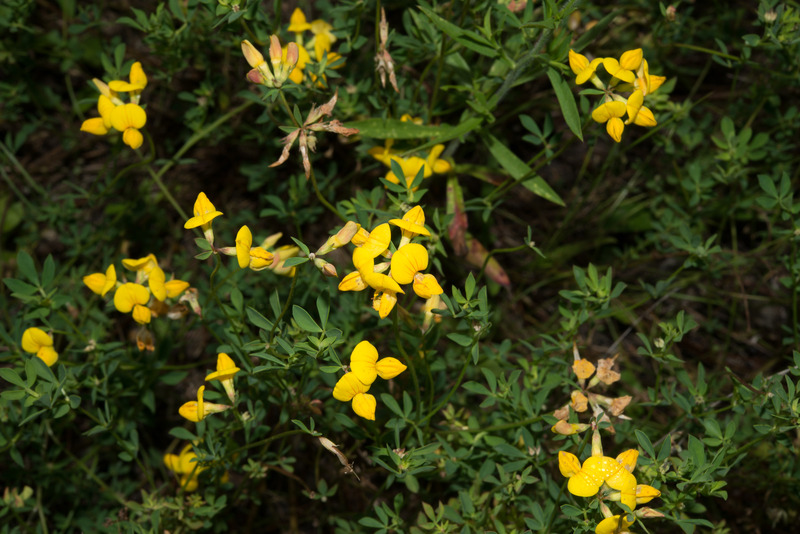 Bird’s foot trefoil is native to the temperate grassland regions of North Africa and Eurasia. 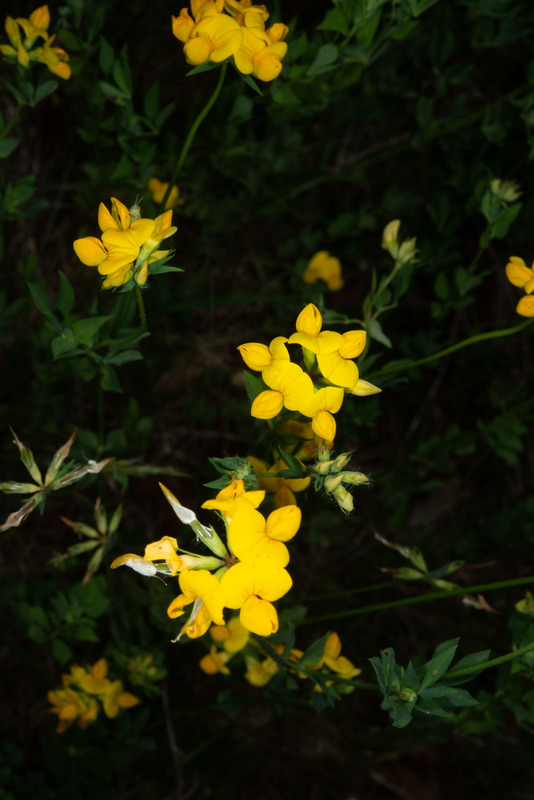 They are naturalized in North America, now widespread, and invasive in some areas. 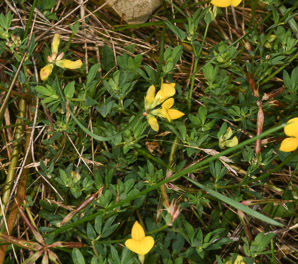 The name stems from the fruits, which resemble a bird’s foot. 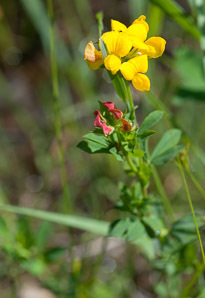 Identification: Plants are 6-24" (15-60 cm) tall. 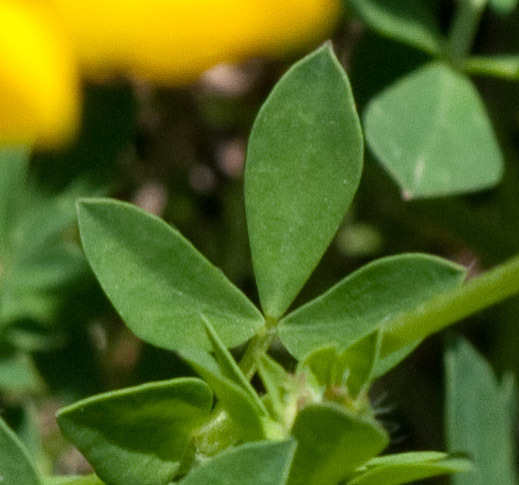 Leaves, pointed ovals in shape, occur in groups of five per petiole. 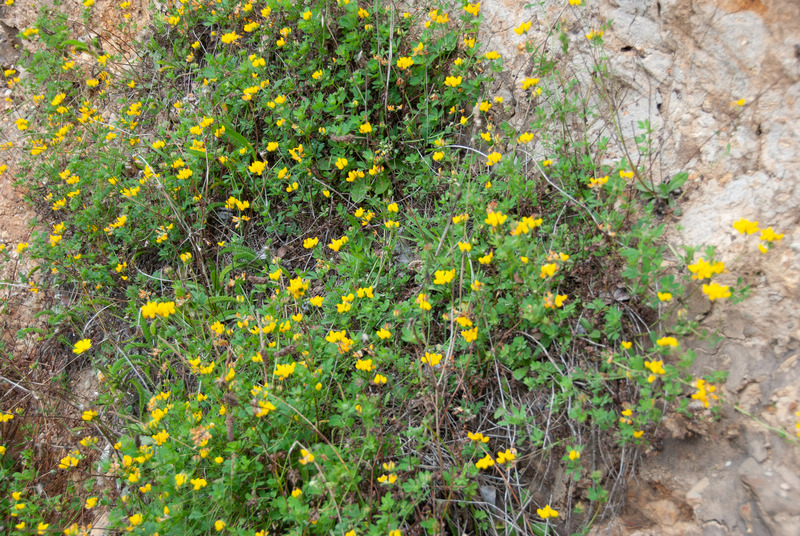 A group of three at the end emerge from the same point, and are ½" (1.3 cm) × ⅛" (3.2 mm). 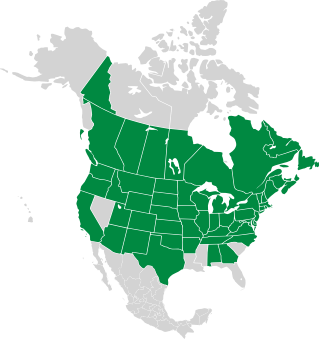 The remaining two are lower, smaller, and opposite to each other. 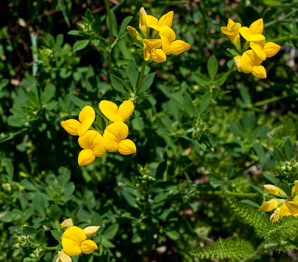 Attractive, bright yellow flowers appear in clusters of two to eight. 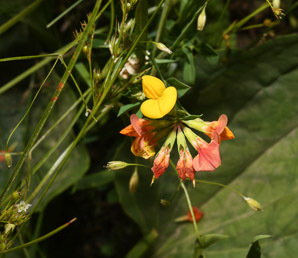 Flowers become more orange in color over time. 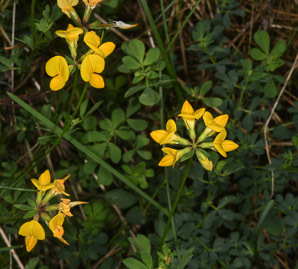 Each flower is bilaterally symmetrical, composed of 3 upper and 2 lower lobes, about ½" (1.3 cm) around. Thin red lines are visible on the upper lobe at close quarters. 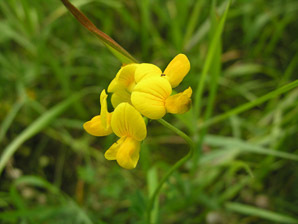 The fruits are shaped like beans, about 1" (2.5 cm) × ⅛" (3.2 mm), in small groups. 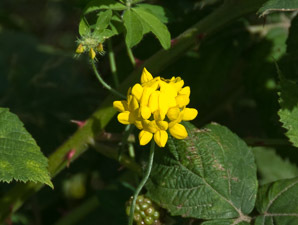 The fruits’ long straight shape and emergence from a central point resemble a bird’s foot. Fruits are green, maturing to dark red. 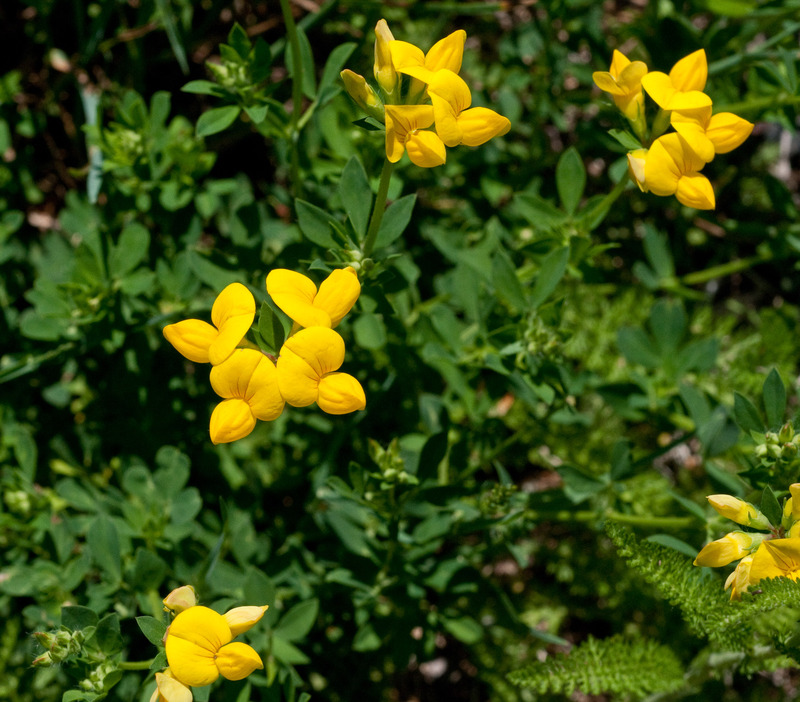 Like other members of the pea family, these plants trap atmospheric nitrogen, making their own fertilizer, allowing them to colonize soils that other plants cannot. 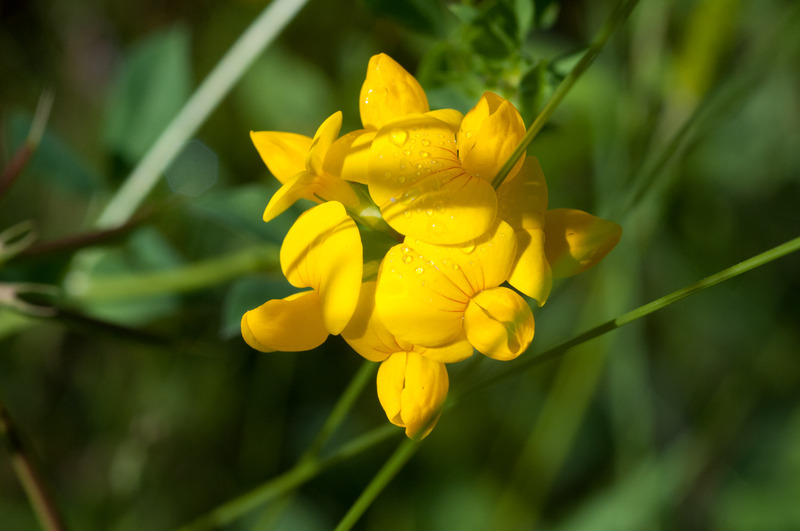 In ultraviolet light, bird’s foot trefoil beckons bees (who, unlike us, can see ultraviolet) very differently—bright red, with blue edges! The photo is by Bjørn Rørslett, who has photographed many flowers in UV light. 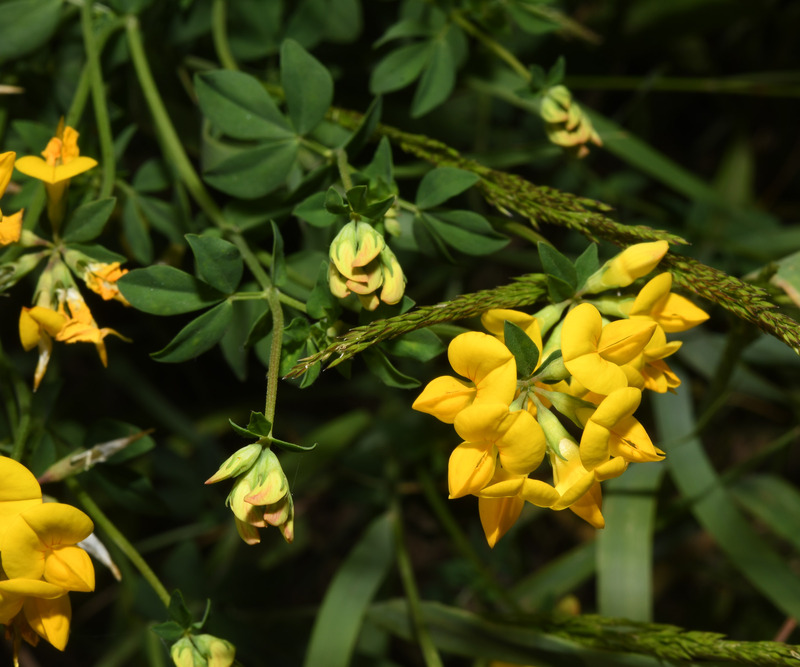 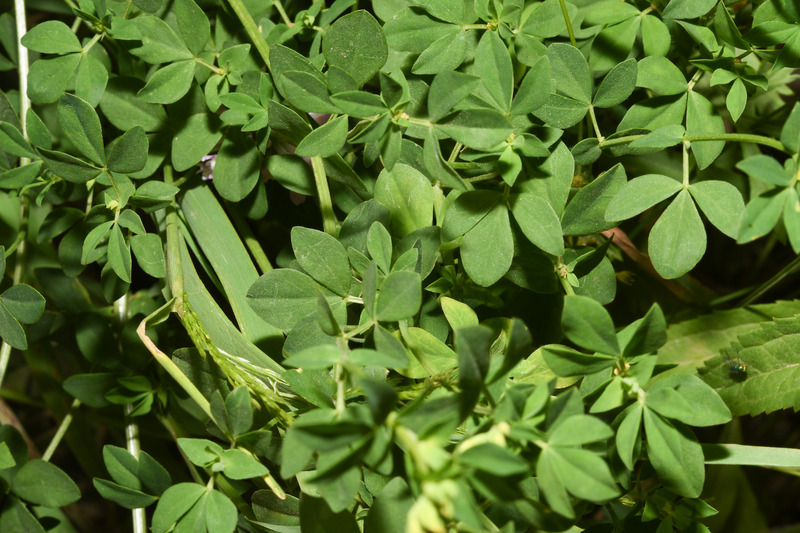 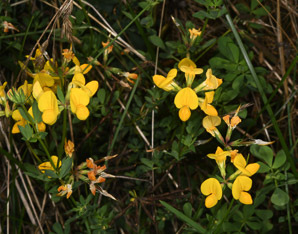 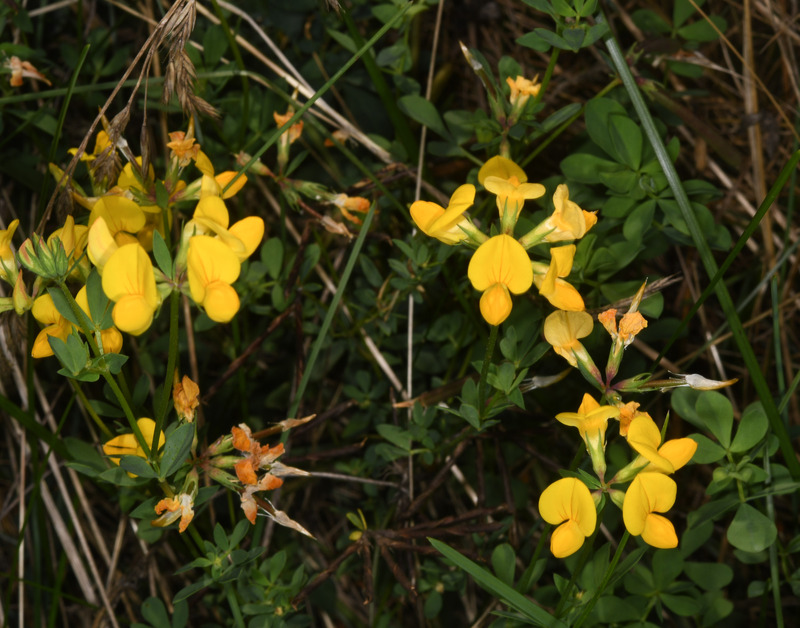 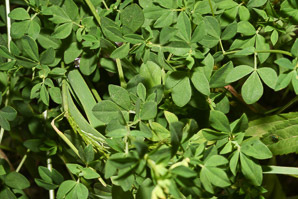 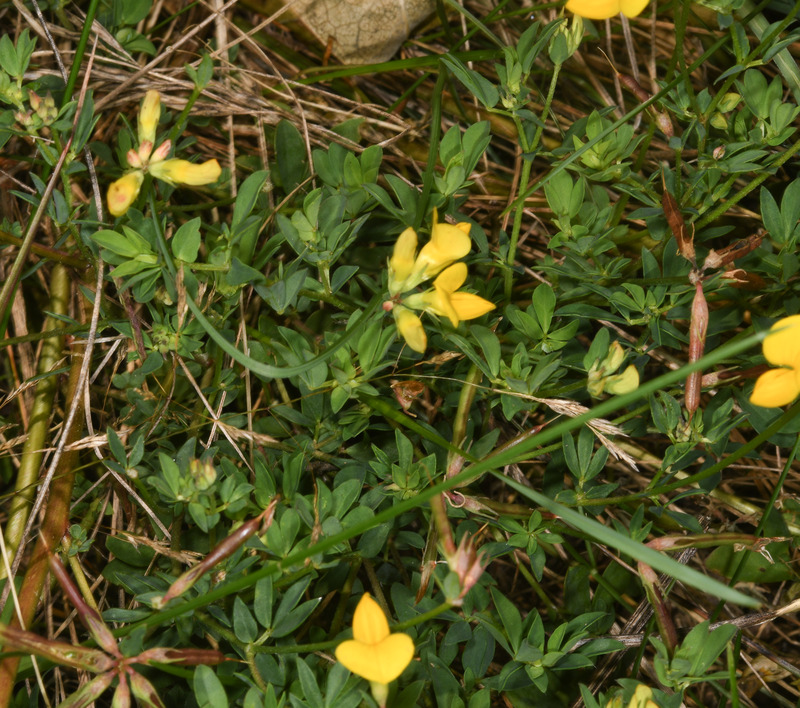 Lotus corniculatus description by Thomas H. Kent, last updated 2 Jan 2019.